Insulin is a naturally-secreted hormone that the body cannot function correctly without. When insulin is depleted, impaired or destroyed within the body, it cannot regulate the amount of glucose in the blood. The body gains a significant proportion of its energy from glucose. What is the role of insulin in diabetes treatment? The answer to this question varies depending on what type of diabetes you suffer from. Type 1 diabetics, whose natural insulin is inadequate or completely destroyed, are heavily reliant on insulin therapy as their ongoing treatment. When insulin treatment is irregular or poorly regimented type 1 diabetics may experience rising blood sugar levels. When this occurs, the body relies on its fat. If this condition is not checked, a life-threatening complication known as diabetic acidosis may occur. Type 2 diabetes is a slightly different disease. The body has not actively destroyed its insulin stocks, but a combination of factors lead to increased resistance to the positive benefits of insulin. At a pre-diabetes level this is known as impaired glucose tolerance. At this stage, the pancreas begins to become overloaded, and cannot produce enough insulin to match the body’s needs. When the pancreas cannot cope, the patient will probably need insulin therapy. However, this only affects approximately 25% of type 2 diabetics (at advanced stages of their conditions), and in many instances this variant of the disease can be controlled through diet and exercise. Individual insulin products are numerous, but insulin may be divided into four major types. Short-acting insulin - Soluble insulin acts quickly (30-60 minutes) and lasts for between 6 and 8 hours. Some types may be faster-acting and shorter-lasting. Intermediate-acting - Isophane insulin acts slightly slower (1-2 hours) and lasts for between 10 and 14 hours. Long-acting insulin - These insulin types (determir, glargine, protamine zinc, zinc suspension) act slowly (1-2 hours) and last much longer, for up to 24 hours. Mixtures of insulin - Mixed short and intermediate-acting insulin, divided into different amounts depending on the individual case. See Diabetes and Insulin and Insulin in the UK for more detailed definitions and a précis of the different products available on the UK market. Which insulin is suitable for me? Insulin is most commonly administered in three different regimes, although this may vary according to each individual patients needs. Two times daily - of short/ intermediate-acting insulin. Administered pre-prandial (before breakfast and evening meal). In theory short-acting provides stability throughout the morning and evening and the intermediate-acting insulin ensures stability through the afternoon and overnight. Other regimes do exist, and some diabetics’ conditions may be controlled by single injections of long-acting insulin. Administering insulin can be a major lifestyle issue for diabetic patients. 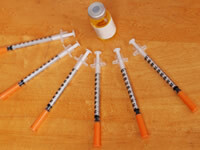 An injection regimen can disrupt the daily routine of many diabetics, particularly adolescents and children. Generally, insulin is administered via disposable insulin pens, or via ampoules designed for multiple-use pens. Most people commonly use 8mm needles although other lengths (12mm, 16mm) are available. Insulin pumps are also sometimes employed. The pump is attached to the patient at all times, and feeds constant insulin to the blood via needle. The pump regulates the amount of insulin. Pumps are still relatively uncommon in the UK. Injections are still the favoured method of administering insulin. They allow the patient more flexibility and most closely resemble the natural processes that should be occurring in the body. Oral insulin is swiftly becoming a reality. Several companies around the world are leading the field in inhaled insulin. Methods include buccal delivery: through the mouth. For more information see Oral insulin. Injection facilitates the speed of absorption into the bloodstream, commonly through the upper arm, the thigh, the buttocks or the abdomen. Medical thinking generally dictates that short-acting insulin should be injected into the skin of the abdomen, intermediate and long-acting should be injected into the thigh, and a mix may be injected into either area. Directions for injection are fairly simple: take a small fold of skin in hand, insert the lancet at an angle, and inject the required amount of insulin. Slowly retract the needle from the injection area. It is a good idea to rotate the injection site regularly, thereby avoiding fatty tissue build-up. If this does occur, amounts of insulin taken up can become irregular. After learning how to properly inject yourself with insulin, and following consultation with specialists, you can begin to administer insulin to yourself. It is necessary to know exactly what the warning signs are of impending hypoglycemia, and how to treat yourself. You will become expert at measuring your blood sugar, and will generally develop a idea of how to maintain controlled blood glucose levels. At initial stages, doctors can help you adjust your regime to suit your lifestyle. When should I vary my insulin schedule? Keeping blood sugar low can be taken too far, and the patient can risk a hypo (hypoglycaemic reaction). A strict balance between control and avoiding hypos is necessary. You may need to administer more short-acting insulin when you eat more than usual or are exercising less. You may be able to reduce the amount of short-acting insulin when the reverse is true: you are eating less or exercising more. Caution is advised if a patient is thinking of adjusting the dose of long-acing insulin as a short term measure - it may continue working for several days. Insulin schedules also vary depending on the patient themselves, and the aim of treating the disease. This may vary according to age and outlook.